There were important issues Indiana Gov. Eric Holcomb failed to mention in his third annual State of the State Address Tuesday night. But the speech hits some high points. Foremost was the governor's surprise announcement that he wants to take $150 million from Indiana's vaunted budget surplus to help school systems increase teacher pay. He had previously requested a $432 million increase in K-through-12 funding for the biennium, but that money might only help keep up with inflation. 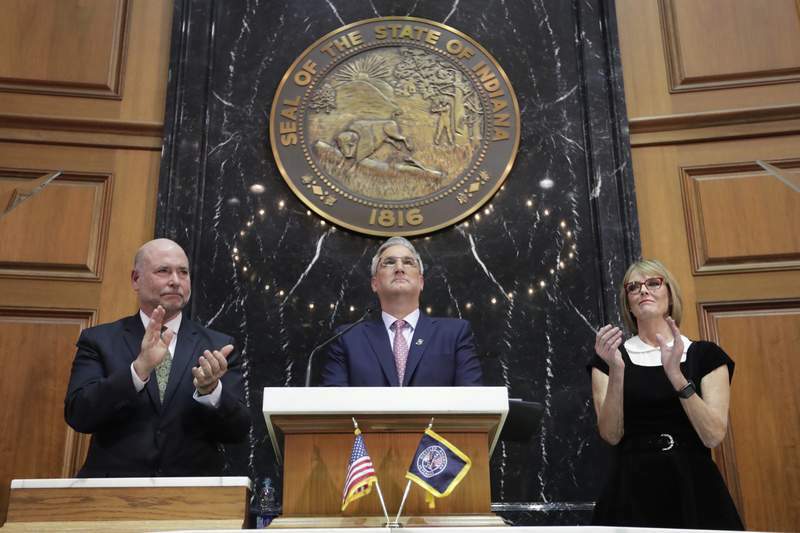 Holcomb's additional plan is to use the budget surplus to reduce teacher pension debt, which he said would save school systems $140 million over the next two years, with continued savings after. The school systems, presumably, would then use that money for teacher raises. Though larger school systems might benefit more from this plan than smaller ones, teachers statewide could see an average salary increase of about $1,000. Granted, it would be a modest step forward: In 2017, when the national average for teacher salaries was $59,000, salaries in Indiana averaged $51,000. But Holcomb's willingness to think out of the box and utilize a portion of the state's predicted $2.1 billion surplus to help attract and retain good teachers is commendable. We hope his announcement of a new commission to study teacher pay is an effort to truly come to terms with this urgent need. Though he asked public school systems to ensure the money they save is spent on teachers, the governor ignored the subject of accountability in school-choice spending. He even failed to repeat his call for the legislature to crack down on virtual charter schools. Last session, lawmakers ignored Holcomb's plea for action after a 2017 investigation by the education news website Indiana Chalkbeat revealed serious deficiencies in such schools. Just last month, Holcomb told Chalkbeat he believed “the stars are aligning” for action this session. Holcomb touched on a worthy list of measures aimed at bettering the health, safety and well-being of Hoosiers, including the battle against drug abuse, school-safety programs, moves to improve and properly fund the state's Department of Child Services and continuing efforts to reduce the state's appalling infant-mortality rate. He made a credible case that such measures, along with such goals as infrastructure improvement and wider broadband availability, go hand in hand with job programs as Indiana tries to compete as a place to live and do business. In that context, though, the governor's failure to express solidarity with the broad coalition of business and health organizations seeking a significant hike in cigarette taxes and a prohibition against sales to those younger than 21 is baffling. Perhaps lawmakers will come to their own realizations such measures could help fund crucial health programs and save money as well as lives by lessening public medical costs. Most of those present in the Statehouse rose to their feet and applauded. But a few legislators remained seated, the latest omen that the simple question of granting protection to the victims of hate crimes may become the year's most contentious issue. Holcomb's decision to lead on this shows conviction and political courage.